Dreamlike and haunting, Kenji Mizoguchi's Ugetsu (AKA Ugetsu Monogatari, 1953) offers a troubling examination of two men whose ambitions eventually prove to be their undoing. Based on a pair short stories from Ueda Akinari's 1776 book of the same name ("The House in the Thicket" and "The Lust of the White Serpent"), the end result is at once a suspenseful period drama and unsettling ghost story that's glacially paced despite its relatively short running time. Punctuated by memorable characters and stylish cinematography, Ugetsu is the kind of film that's more captivating than enjoyable but will nonetheless linger in your memory long after its conclusion is reached. The two men in question are Genjuro (Masayuki Mori) and Tobei (Sakae Ozawa), two peasant farmers: the former practices pottery in his spare time, while the latter has ambitions of becoming a samurai but no money for armor and a spear. Regardless, they work together to sell Genjuro's pottery and fortune smiles upon them: his wares are selling briskly during the recent time of war despite warnings from Genjuro's wife Miyagi (Kinuyo Tanaka). After an invasion threatens their farming community---and motivated by the prospect of escaping poverty---all four refugees (along with Genjuro and Miyagi's son, Gen'ichi) set off for greener pastures across the water, where they're warned again by the recent victim of a pirate attack. Not surprisingly, things go downhill quickly from there. 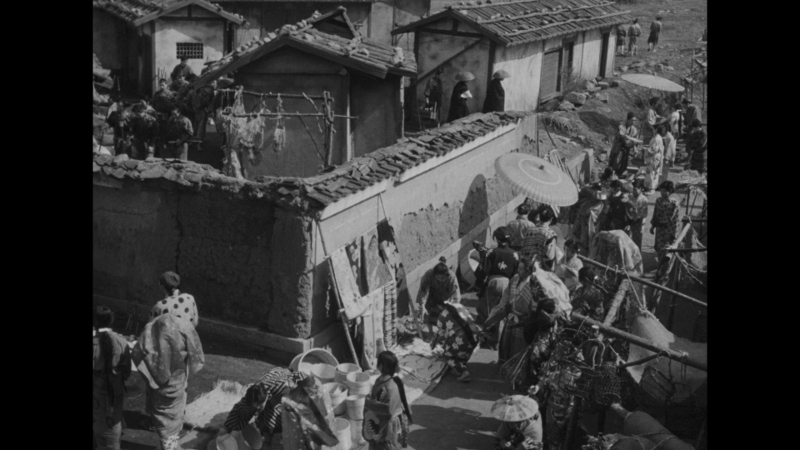 The cautionary tale of Ugetsu, much like Mizoguchi's bookending films The Life of Oharu and Sansho the Bailiff, is an extremely tough watch at times: several main and supporting characters are doomed by their own choices, while others fall victim to chance for simply being accessories. (I'm not a believer in karma by any stretch, yet it's obvious enough that taking big risks in sequence almost ensures a high probability of failure.) The fate of Genjuro, Tobei, and their families unfolds at different speeds in drastically distinct atmospheres: perhaps the most memorable is Genjuro's encounter with mysterious Lady Wakasa (Machiko Kyo, who appeared with Masayuki Mori in Rashomon as the married couple), which takes a decidedly surreal and dreamlike turn as Ugetsu's second half unfolds. 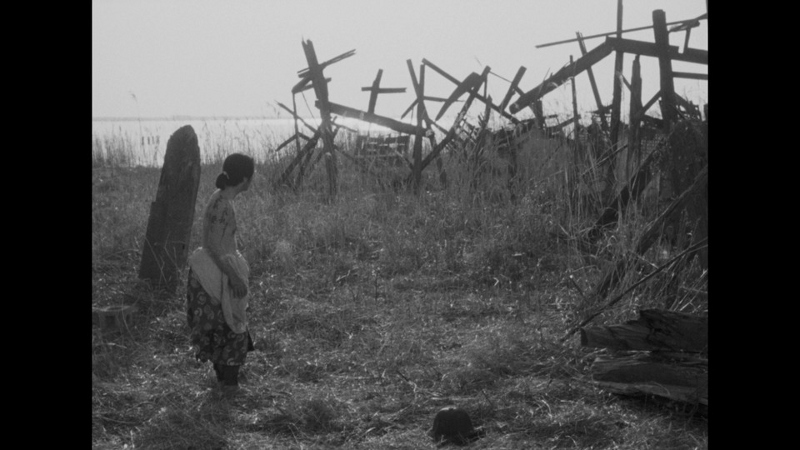 Featuring wonderful cinematography by Kazuo Miyagawa (who also shot Rashomon, as well as Yojimbo), Ugetsu at least has the decency to serves up plenty of rich visuals along with all the heartbreak, violence, and chaos. Long relegated to cult status outside its native Japan, Criterion's outstanding 2005 DVD served as a fine home video introduction for newcomers. Featuring a solid A/V presentation, a wealth of extras (including a full-length documentary about director Kenji Mizoguchi featured on the second disc), and stylish packaging that perfectly captured Ugetsu's atmosphere, the well-rounded disc has been faithfully ported over to Blu-ray: it features a crisp new 4K-sourced 1080p transfer and lossless audio, while just about everything else is exactly the same as before. 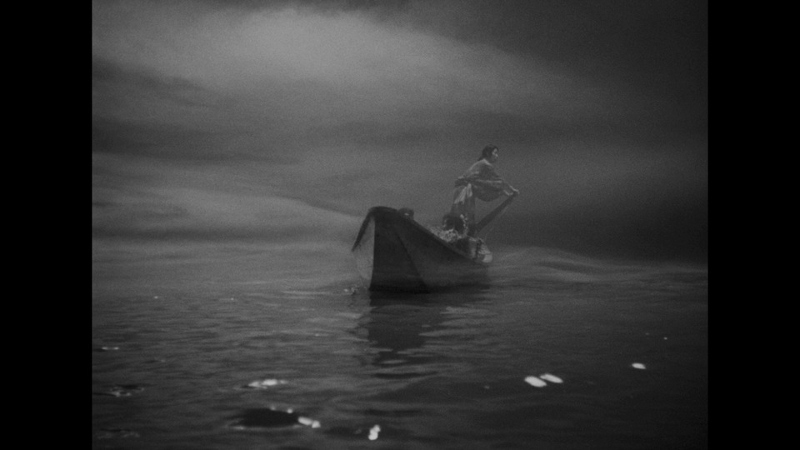 Not surprisingly, Ugetsu's visuals are rendered nicely on this 1.33:1, 1080p transfer, which was sourced from a new 4K digital restoration and obviously runs circles around Criterion's 2005 DVD in just about every department. Image detail and textures are quite strong at times, with a reasonable amount of depth, good contrast, and more well-balanced black levels in the darker scenes. A few mild distractions can still be spotted along the way: slight flickering and occasional moments of softness, which may very well be source-related issues. Considering the state of many Japanese films from this era, Criterion's Blu-ray represents a top-tier effort and Ugetsu's finest visual appearance on home video to date. Fans and first-timers should have no problem appreciating what we get here. DISCLAIMER: The screens caps featured in this review are strictly decorative and do not represent Blu-Ray's native 1080p resolution. The Japanese LPCM 1.0 mono track is perfectly acceptable overall. The high end definitely feels a little cramped on many occasions; this is obviously a source material issue and, considering the film's age, it's entirely forgivable and barely a distraction in the first place. Dialogue and background effects are generally clear and well balanced, offering a modest amount of depth and occasional layers that add to the film's haunting atmosphere. Optional English subtitles are presented during the main feature for Japanese audio and partial text translation only. As expected, Criterion's interface is smooth, descriptive, and easy to navigate. This one-disc release is packaged in a slimmed-down digipak case with artwork that re-purposes their 2005 DVD's stunning and appropriate design. The included Booklet (more an entire book, really)) features vintage photos, technical specs, an essay by film critic Phillip Lopate, and three short stories that influenced Mizoguchi during the development of Ugetsu. Everything from Criterion's 2005 DVD. These recycled extras include an Audio Commentary by film critic Tony Rayns, the terrific 2 1/2 hour documentary Kenji Mizoguchi - The Life of a Film Director, three Interviews (filmmaker Masahiro Shinoda, Ugetsu's assistant director Tokuzo Tanaka, and cinematographer Kazuo Miyagawa), and three Trailers for the film. These are great supplements...but if you own Criterion's DVD, you knew that already. Haunting but at times glacially paced, Kenji Mizoguchi's Ugetsu is a singular and very memorable slice of Japanese cinema that sticks with you long after the film's final moments. Featuring great performances and a surreal, dreamlike atmosphere at times, there's a lot of take in and most of it has held up well during the last 64 years. Criterion's new Blu-ray offers a strong upgrade in the A/V department, thanks to a new 4K-sourced 1080p transfer and lossless audio; the bonus features are plentiful, but entirely recycled from their 2005 DVD. This is obviously worth a purchase for previous owners, while newcomers and more casual fans may want to rent it first. Recommended.